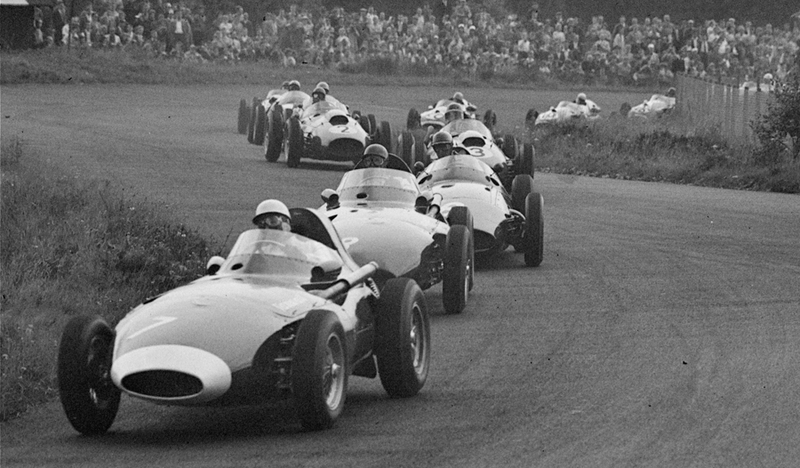 The record books will show that Tony Brooks won the 1958 German Grand Prix, but for the second time in three races the day was overshadowed by the death of a Ferrari driver, in this case Peter Collins who a fortnight earlier had won the British Grand Prix. Championship leader and Collins' Ferrari team-mate Mike Hawthorn was on pole but was again left to battle early on by the Vanwalls of Stirling Moss and Brooks. But for the second race running Moss' car failed under pressure and he retired after three laps with electrical problems, although this time Brooks managed to pass both the Ferraris and take the lead on the tenth lap. As Collins sought to get back at Brooks he lost control and his Ferrari rolled two or three times, flinging him into the bushes. He was airlifted to hospital in an army helicopter with serious head and arm injuries and given a blood transfusion but died later that day. His wife of 18 months, the actress Louise Cordier, was in the pits and was at his side when he died. On the same lap, Hawthorn glided to a halt with engine trouble, and rushed to the hospital. "I was right behind Peter," he told reporters. "His car tipped the bank and went over." That left Brooks in an unassailable position, but there was a fierce tussle for second between Roy Salvadori's Cooper and Cliff Allison's Lotus which was settled when Allison had to pit, leaving Maurice Trintignant to bring home his own Cooper in third, completing an excellent day for the small Surbiton manufacturer.